Digital radiography (digital X-ray) is the latest technology used to take dental X-rays. This technique uses a digital sensor (instead of X-ray film) that captures and stores the digital image on a computer. 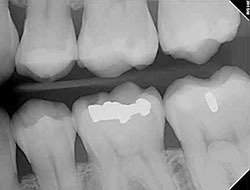 This image can be instantly viewed and enlarged, helping the dentist and dental hygienist detect problems more easily. Digital X-rays reduce radiation 80-90% compared to the already low exposure of traditional dental X-rays. A digital full-mouth Panoramic X-ray is recommended for new patients and is usually updated every three to five years. Bitewing X-rays (X-rays of top and bottom teeth biting together) are taken at re-care visits and are recommended yearly to detect new dental problems.